When I started blogging, I only blogged about beauty and fashion. After starting to eat Paleo, I fell in love with writing about food, staying healthy, and gardening. I have gotten away from posting my beauty finds, but I want to share what I use. Last year I threw away all of my makeup that contained tons of chemicals, and that wasn't cruelty free. I cleaned house and threw away soaps, shampoos and conditioners, and the normal household cleaning products. It makes me happy that Target offers alternative products that I can trust in my house. We love using Shea Moisture Coconut and Hibiscus Shea Butter Soap. This is my go-to bar of soap - and the whole family uses it. It doesn't dry out your skin like other soaps. They stand behind no animal testing, natural and organic, and they use ethically sourced ingredients. 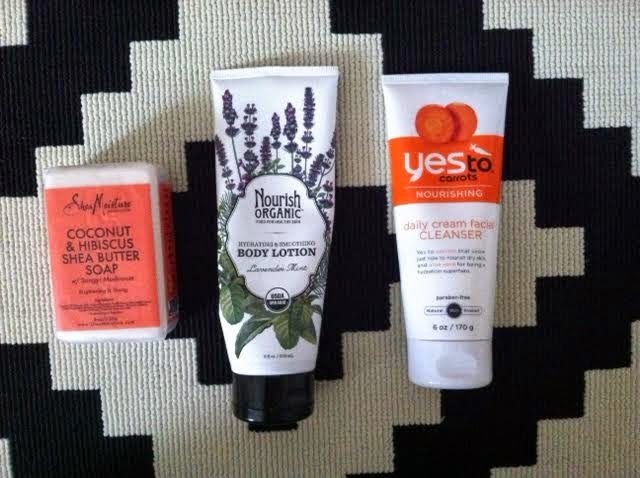 Another great find is Nourish Organic body lotion in Lavender Mint. This body lotion smells AMAZING. It is so calming and relaxing, and goes on really smooth. Their products are 100% chemical free, vegan, Leaping Bunny approved, gluten free, and organic - just to name a few. Say Yes to Carrots is another brand I really like. I am not the girl that continually uses the same face wash. I like to try new brands, and then I go back to ones that I really like. Say Yes to Carrots is one that I have used in the past, and really have zero complaints. Their Daily Cream Face Cleanser is a great morning face wash. Their product is 96% natural, petroleum and paraben free, and cruelty free! If you are out, and see some of these products, you should give them a try!